If you’ve ever been to Brazil and had a drink, it would not surprise me if you replied by saying ‘cachaça’. Why? Well cachaça is the most popular beverage in Brazil where in 2007, over 1.5 billion litres were consumed. One brand you may have come across on your travels, or indeed seen a little closer to home, may have been Pitú. Around since 1935 due to the dedication to the art of making cachaça by a company named Engarrafamento Pitu Ltda – the combination of Ferrer de Morais and Cândido Carneiro families, located in the State of Pernambuco, northeast Brazil. No expense is apparently spared in obtaining the finest sugar cane, pure water, and pedigreed yeast which are then all utilized by master distillers. Only the sugar-cane juice from the first pressings is used as this contains the fresh, pure taste that the family have been after for years on end. A maturing process of several weeks in a wooden vat allows the taste to unfold. To name it Pitú, the story goes that the heads of the families met one evening at the river separating their family estates while their children played together on the riverbank. One of their favourite games was drawing pictures of things that they had just seen in the sand. The others had to guess what they had drawn. One of the children drew a picture of a ‘Pitú’, a species of fresh-water crab that is found only in that river and is very rare. 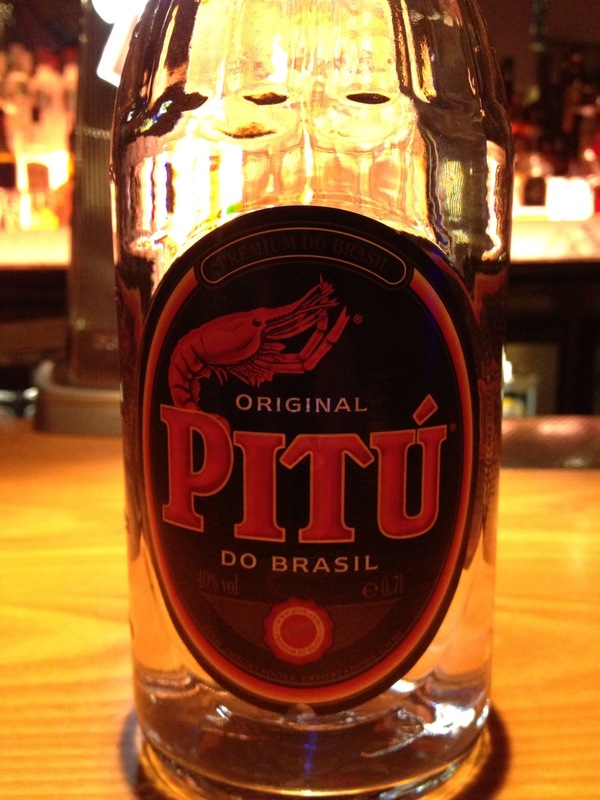 When the heads of the families saw the drawing, they immediately knew that ‘Pitú’ was the ideal name for their drink. A strong, yet fresh nose of butter and corn that mellows once it hits the palate. Rather soft with the butter flavour lingering to create a long finish. Slight wood notes near the end too. Cut lime into small pieces and place in an old-fashioned glass. Add sugar. Muddle lime and sugar with a spoon. Fill glass with ice. Add Pitú. Put contents in shaker, shake well, return contents to glass and serve. Put ingredients in cocktail shaker. Shake and strain into a chilled cocktail glass. Pitú is a rather diverse spirit, going well with cocktails, mixers such as coke or orange, or even over ice. There’s a reason why cachaça is the number one selling drink in Brazil, and bumper sales around the world. Purchase a bottle here and check out the rest of the photos via my Facebook page. may have his or her own idea of how the session should go. Liver function is not the only body part affected by alcohol. this consequence if you happen to go overboard.